Graphic designer with over 18 years experience in the art field. I have been working as an artist since 1987 with an emphasis in graphic design and printing. 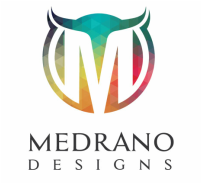 In 2000, I started my own graphic design business based MEDRANO DESIGNS. I have extensive experience working with city government as well as the performing arts industry. I have worked with City of La Mirada, La Mirada Theatre for the Performing Arts, City of Montebello, City of Duarte, City of Gardena, McCoy Rigby Entertainment and Theatre LA among others. I designed artwork/marketing materials for 2 national tours, Camelot, starring Michael York and Peter Pan, starring Cathy Rigby. I also have experience working with non-profit organizations, helping them achieve a high quality professional image. As a owner of a successful freelance graphic design business, I would love to discuss any possible design and advertising needs you may have. I operate a Macintosh platform with extensive experience using programs such as Adobe Photoshop, Illustrator and InDesign.